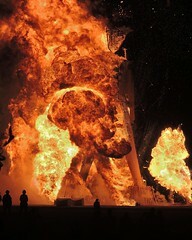 This is the site for people from the Montreal area who are part of the Burning Man community. 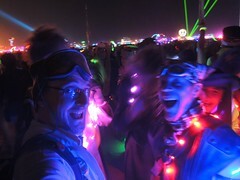 That’s people who have been to Burning Man and felt attuned to it, people who have been to Burning Man regional events and felt attuned to them, and people who know what we’re talking about and are attuned to that sense of community and creative expression. We gather together sometimes to be silly, to drink beer, to create amazing things, to participate in random events, and to scheme. Many of us spend much of our summers working together to plan and prepare for our trek to the playa of northern Nevada for the Burning Man festival, for the full week leading to the first Monday of September. This website is curated by a handful of Montreal burners, and is intended as resource for the entire Brûleurs de Montréal Burners community. Anyone who wants to contribute something here is encouraged to do so. 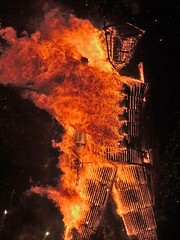 I first burned in 2002 and went back in 2004, 2006 and straight through to 2009. 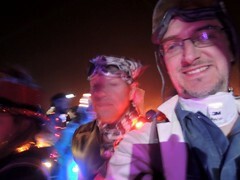 In 2007 I moved from Calgary to Montreal with Burning Man as an extended pit stop. I started poutine camp in 2008 serving 130 that year and an astounding 1300 in 2009! Glenn is a mad scientist who commands an army of microchip controlled penguins and pacifies them when they’re not on a mission with zolpidem pills covered in chocolate. Science hails from London, but not the London you think. He has been here for as long as any of us can remember. The Bruleurs de Montreal Burners are a part of the Burning Man Regional Network. See what’s going on in your region.